Pregnancy and Birth: The Essential Checklists covers everything parents need to know and more when expecting a new baby. It alerts parents as to what to prepare, what to buy, what to ask, what to do, and when to do it. It not only shows parents how to stay on top of everything, but it also helps them to remain one step ahead. This guide is highly practical, comprehensive and straightforward, comprising essential lists of simple steps and reminders to help parents anticipate everything they need to do in pregnancy, during birth, and with their newborn baby. Starting with what to do when the test is positive (for example, book to see your doctor and begin taking folic acid), it takes parents right through to the essential clothes, toys and equipment to buy and developmental milestones for 0-3, 3-6, 6-9 and 9-12 months and preparing for their baby's first birthday party. It covers all the planning for the minutiae of daily life, listing what to put in the pregnancy handbag and how many diapers to buy, and listing everything needed for the big day (for example the birth plan, the birth partner's checklist, reflexology for labor and what labor snacks to bring along). The guide takes the panic out of hospital appointments with checklists covering prenatal appointments and tests, antenatal checks and baby's first health checks. Included here are also essential questions to ask the doctor. There are lists of questions elsewhere, too, for example, questions to ask prospective nannies. 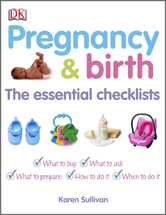 Pregnancy and Birth: The Essential Checklists is the perfect companion for time-starved parents and parents-to-be, taking the stress out of planning ahead.